Residents at The Lawns Care Home in Oadby have recently enjoyed receiving updates from their loved ones with our new Magic Moments Club App on our iPads. In addition to many other fantastic features, the App has been designed to help residents and relatives stay in regular touch by sending video and text messages and sharing photos and stories - which really comes into its own if relatives live far away or are on holiday. 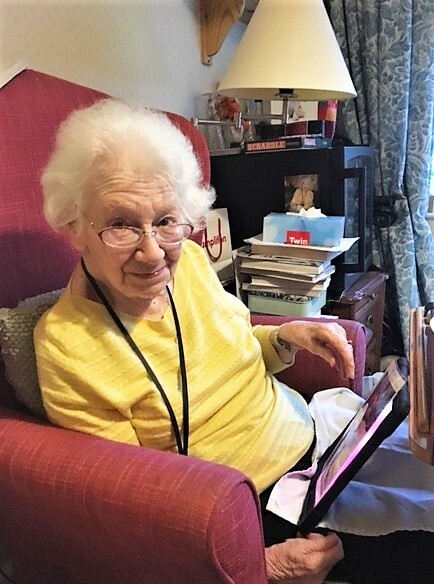 Our resident Jean Clayton, 94, has been using the App recently to see messages and photos from her family. They send her photos regularly, particularly her grandson who often sends recent photographs of his small son Samuel, Jean’s great-grandson! At The Lawns Care Home we believe in living life to the full. That’s why we’re passionate about creating vibrant, stimulating activities that will help our residents to love every day. We call them ‘Magic Moments’. The Lawns Care Home is located in Oadby, Leicestershire and provides ​residential care and respite care.